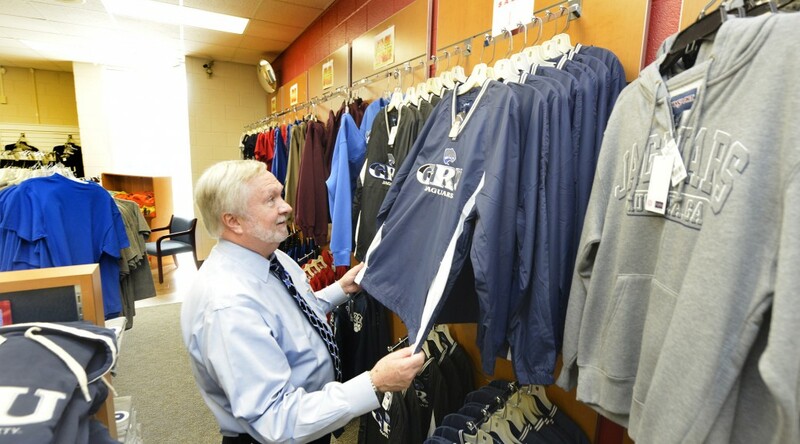 Residents of the CSRA will have a chance to give back to the community during Georgia Regents University’s Day of Service on Sept. 12. Community members are invited to join GRU employees, students and their families to help organizations in our area through volunteer service. Volunteer opportunities – some of which welcome children – include playing with and walking pets, doing lawn work, painting walls and interacting with veterans. Time of service varies according to activity and venue needs. All volunteers will get a free Day of Service T-shirt and wristband, which they can pick up on Sept. 9 from 11:30 a.m. to 1:30 p.m. at the GRU Wellness Center at 1459 Laney Walker Blvd., Augusta, or in the Jaguar Student Activities Center breezeway on GRU’s Summerville Campus at 2500 Walton Way, Augusta. Volunteers will also get a free pass with their Day of Service wristband to a special celebration, which will include a jazz concert with Wycliffe Gordon & NuFunk Revolution, Travis Shaw and the Mike Frost Band. There will also be a barbecue while it lasts. The celebration will kick off at 5:30 p.m. on Sept. 12, following Day of Service Activities, at the D. Douglas Barnard Amphitheatre on GRU’s Summerville campus. To sign up to volunteer for Day of Service, click here. Each volunteer must complete a separate registration, including children. The deadline for registration is Sept. 10. Click here to sign. For more information, please email dayofservice@gru.edu. 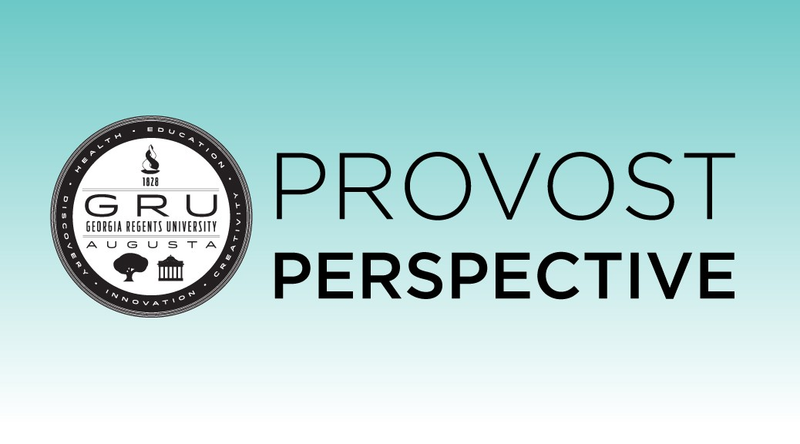 As provost, Dr. Gretchen Caughman frequently addresses faculty concerning issues involving the university, but seldom does she get the opportunity to speak to as many at one time as she did last week at the faculty kickoff meeting at the Maxwell Theatre. 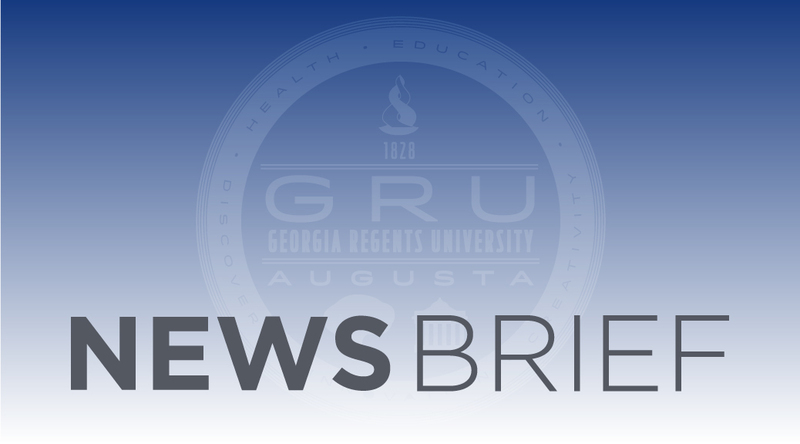 There, Caughman kicked off the new academic year by presenting a long list of priorities while also emphasizing the importance of teamwork and getting to know fellow faculty members. 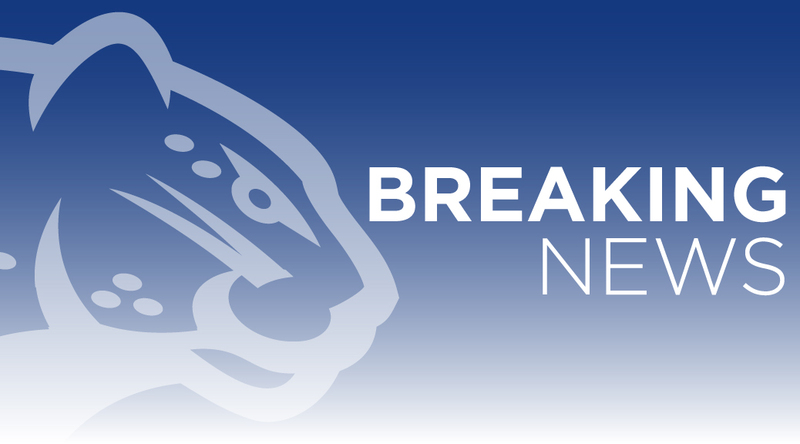 Later, after talking about the importance of the University Senate, introducing new faculty and sharing the stage with Augustus, the new Jaguar mascot, Caughman presented President Brooks Keel. 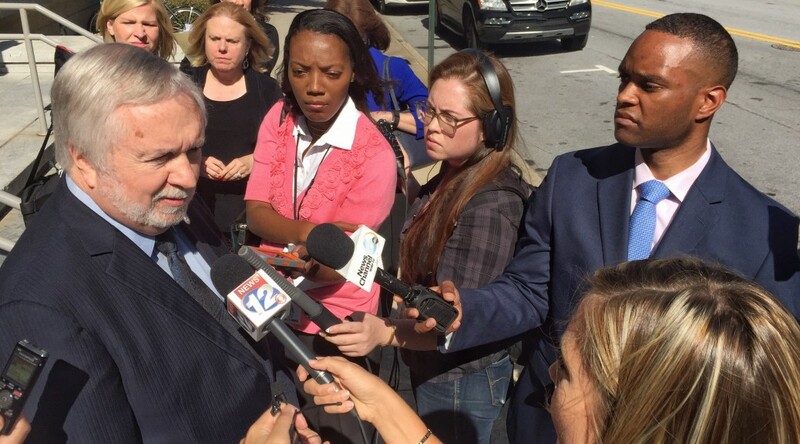 When it came to the point where he would normally start talking about vision, however, Keel stopped. 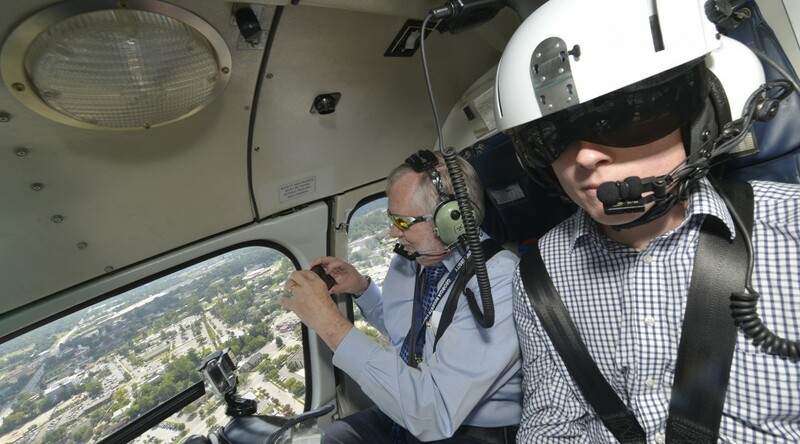 Then, he highlighted some areas of importance, including the Cyber Institute, making GRU a destination campus and using the strong performing arts culture on the Summerville Campus as a driver to help recruit business and industry to the community. Click here to watch a video of the entire presentation. Few events in an individual’s life resonate quite as strongly as going to college. For many, the first day is an initiation – a rite of passage that ushers students from the perceived worries of their youth into the realities of adulthood. For others, it is a challenge – a test of ability in which winners are determined through grade point averages and certificates of merit. And for some, it is simply the next in a long line of forward-looking steps. 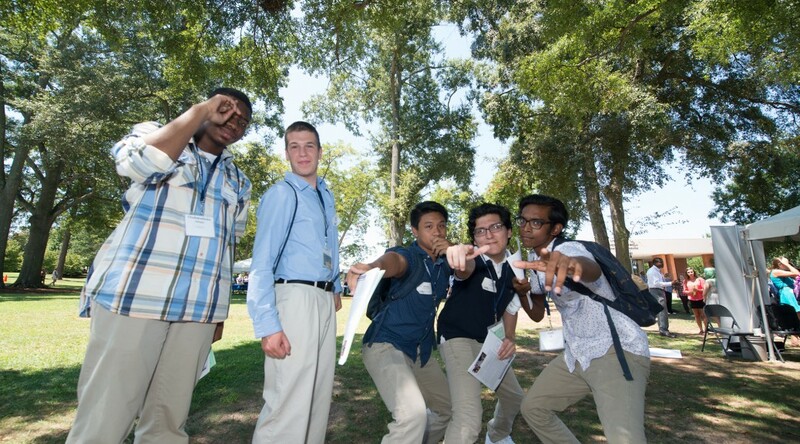 On Aug. 14, Georgia Regents University welcomed hundreds of new freshmen into the fold with a day of celebration and learning as part of the 2015 Freshman Convocation. Introduced by Dr. Gretchen Caughman, President Brooks Keel also greeted students, providing encouragement and welcoming the class of 2019 to the GRU family as one newcomer to another. Keel extolled the value of graduating within four years and praised faculty both for their care and dedication to the art of teaching. Following Keel’s speech, Col. Sam Anderson, garrison commander of Fort Gordon, took the stage to speak to students about the importance of being leaders. Anderson concluded with a quote from Adm. William H. McRaven, whose original speech at the 2014 commencement of the University of Texas at Austin has gained worldwide attention on YouTube. Following Anderson came the presenter students were most looking forward to hearing from: GRU sophomore Lucas “Luke” Street. Having worked as a Retreat Week Leader, a Peer Mentor and Orientation Leader, Street has encouraged dozens of new students to find new ways to get involved on campus. In addition to general tips about being a freshman, Street offered incoming students a few pieces of important advice. 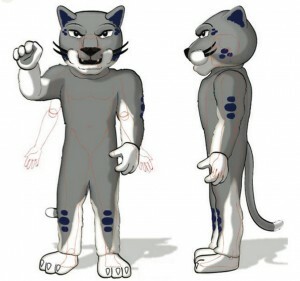 After a long rollout that included a series of videos chronicling the career-ending injury of former mascot Al E. Cat and the search for his replacement, Georgia Regents University’s new mascot, Augustus, was welcomed to Jaguar Nation Tuesday in an energy-filled ceremony at the Jaguar Student Activity Center. “This is a very important day for Jaguar Nation,” said Athletic Director Clint Bryant, who followed his opening remarks by touching on the history of the Jaguar mascot. Only four universities in the nation are known as the Jaguars, Bryant said: GRU, South Alabama University, Southern University and Indiana University – Purdue University Indianapolis. 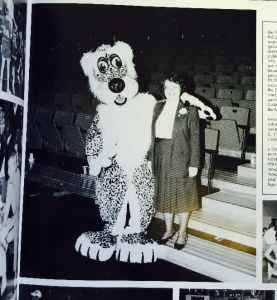 And though the Summerville Campus has been the Jaguars since the 1930s, it wasn’t until 1992 that the school had its first mascot: Al E. Cat. The name, chosen from 250 entries, earned the winner $50. 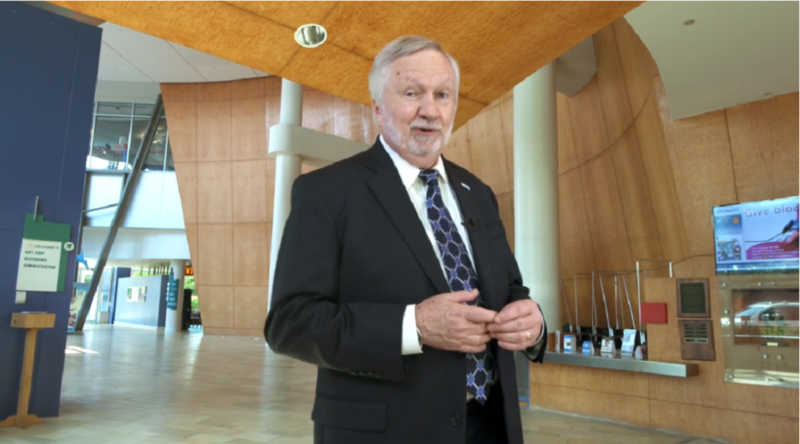 President Brooks Keel, a graduate of both Augusta College and the Medical College of Georgia, noted the consolidation of the two schools while giving a nod to its binding traditions. Shortly after Keel spoke, Augustus made his big entrance. Brian Marshall, a marketing specialist with the Division of Communications and Marketing, was instrumental in the creation of the new mascot, which was developed with the help of Weir/Stewart, an Augusta advertising firm. Having actually performed while wearing the innovative new suit, Marshall has a unique insight. Another unique aspect of the suit is the feet, which he said are worn like slippers. 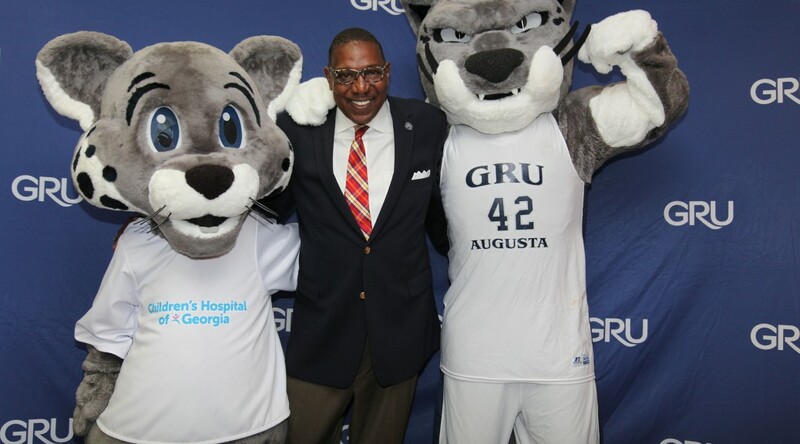 And because many of the larger schools utilize multiple mascot suits, GRU actually has two Augustus suits. While the design process was intense, it was fun and rewarding for all involved. 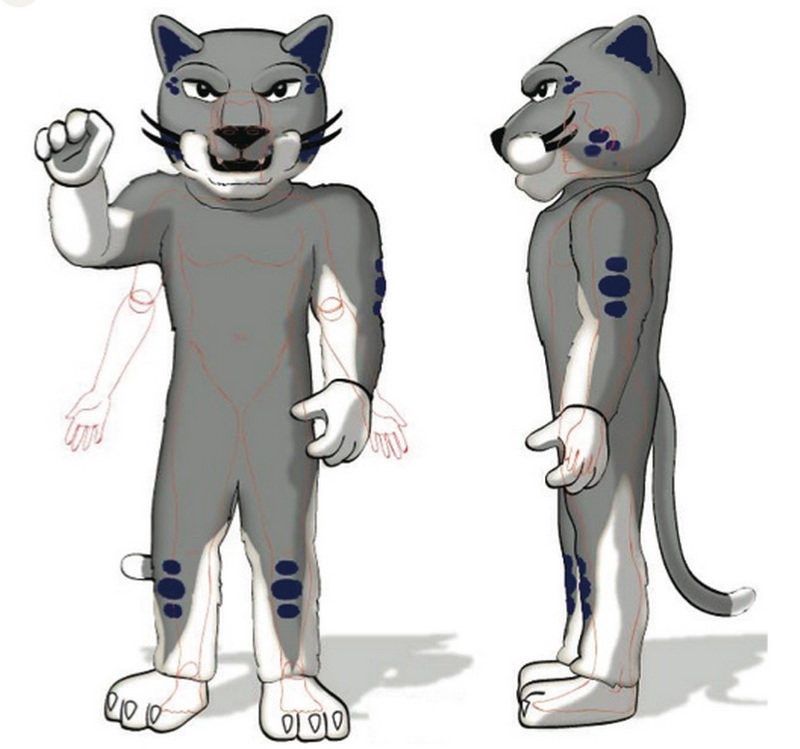 The suit was delivered in late April, which was a little too late in the school year for a proper rollout, so the team decided to wait to officially welcome Augustus until the first week of the 2015-16 school year, though Augustus was busy over the summer filming videos and interacting with students during different orientation sessions. 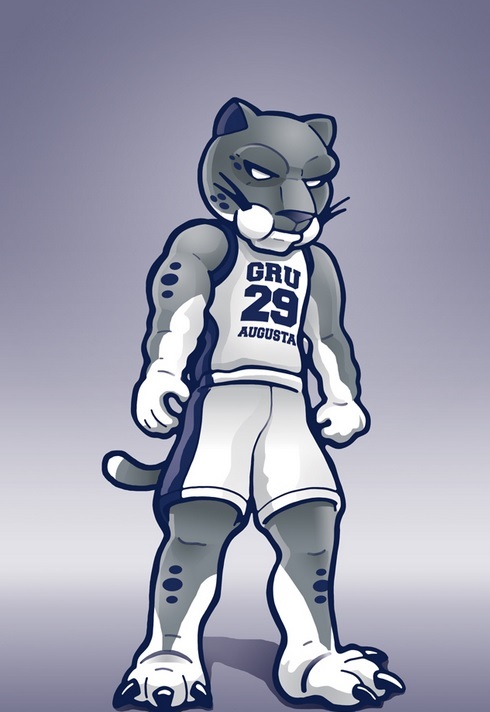 Show your Jaguar spirit – pull out your blue and gray gear and join us as we celebrate GRU’s annual Spirit Day! 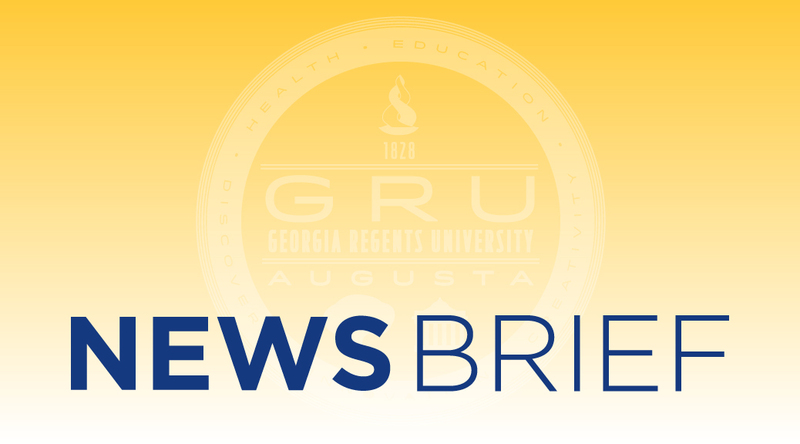 The first day of classes each semester will now be known as GRU Spirit Day for all students, faculty, staff and health system employees. On Monday, Aug. 17, wear your blue and gray attire, take a selfie and tag @GeorgiaRegents and you might just win a $25 gift certificate valid at either JagStore.